The Department of Electrical and Computer Engineering undergraduate degree programs feature cutting-edge education labs, dedicated faculty who encourage student-led research, and ties with leading companies, utilities, and agencies. The Electrical Engineering curriculum requires a minimum of 120 credits to degree completion. Undergraduate students pursue a common foundation in math, physics, chemistry, and an introduction to engineering design and programming. Sophomores and juniors will concentrate on the electrical engineering core curriculum and seniors will choose from a wide variety of electrical engineering elective courses from the following sub-disciplines: Communications and Signal Processing, Computer Engineering, Electrophysics, Microelectronics, Power Systems, and Controls. The Computer Engineering curriculum requires a minimum of 122 credits to degree completion. 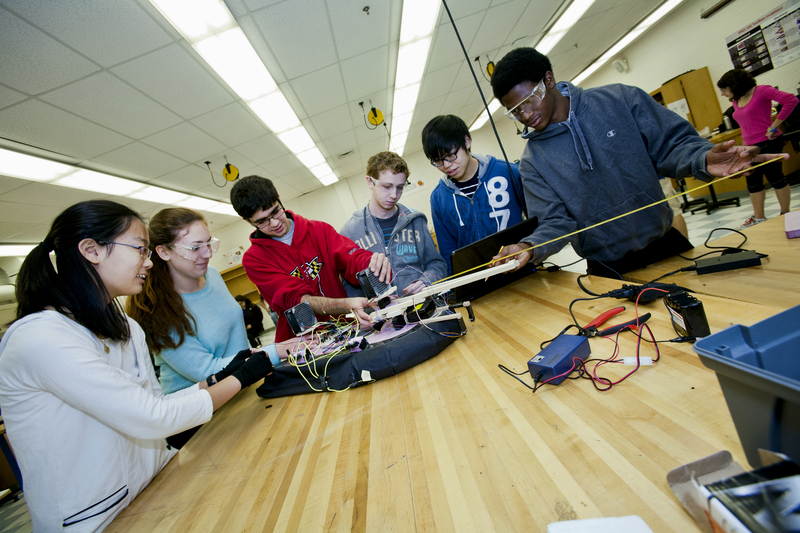 Undergraduate students pursue a common foundation in math, physics, and chemistry (as well as computer and engineering sciences), then concentrate on the computer engineering core curriculum during sophomore and junior years. This minor is available to all undergraduate students in the A. James Clark School of Engineering. The minor will introduce students to core hardware concepts such as computer architecture, digital logic design, and digital circuit design, as well as core software concepts such as algorithms, discrete mathematics, and programming.